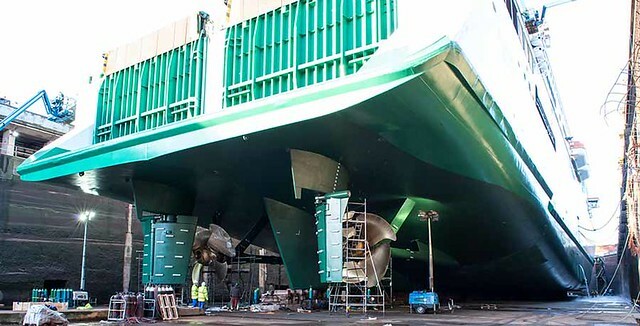 The MV Ulysses, the leading Irish Ferries freight and tourism vessel on the Dublin to Holyhead route, returned to Dublin on Wednesday February 13th following a €4m upgrade at Cammell Laird shipyard in Merseyside. 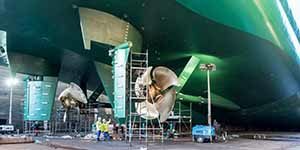 The four week upgrade included new propellers, new rudder components, a full refurbishment of her stern thruster, underwater works, engine overhauls and Vehicle Deck painting programmes. 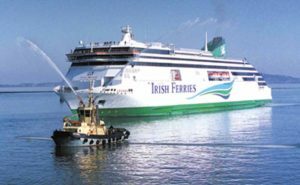 Ulysses, one of three of Irish Ferries fleet of six ships to service the Dublin to Holyhead route, suffered chronic unserviceability in the final week of June due to technical difficulties. These related to the Ulysses’ starboard controllable pitch propeller which required an out of schedule drydock and the lead-time to machine specialist parts. This level of cancellation was unprecedented given that vessel’s previous 99pc schedule integrity since entering service in 2001 to 2017. While Irish Ferries undertook mitigating actions to reduce the effect of the disruption by rescheduling other vessels in its fleet, the disruption resulted in a significant reduction in Irish Ferries Ro Ro capacity in June. Andrew Sheen, Irish Ferries Managing Director said “Birkenhead based shipyard and engineering service company Cammell Laird was chosen for the MV Ulysses dry dock refurbishment due to their extensive expertise and a strong track record with this vessel.This is a significant investment in the Ulysses, which we know is a much-loved ship for both freight and tourism traffic. We are delighted to see her return to service to continue to provide the comfort and reliability that our customers expect from the Irish Ferries fleet”.